In today’s fast-paced environment, Solver is a proud leader in delivering innovative, business driven solutions to the global market place. Solver is the leading provider of complete Corporate Performance Management (CPM) solutions for today’s mid-market enterprise and the company is at the forefront of CPM technology with deep ERP integrations. Solver’s BI360 solution is available both as a cloud and on premise deployment and it offers powerful and intuitive modules for reporting, budgeting, dashboards and data warehousing. Founded in 1996, Solver is changing the face of CPM with next generation, collaborative and action-driven solutions for planning, reporting and analysis to deliver complete insight into every facet of the enterprise. BI360 gives the entire organization the ability to truly understand their data, make better decisions, and ultimately drive efficiency and performance in their business. Empowering you to be a workplace hero by enabling world-class decisions at every level of an organization. Solver's mission is to enable world-class decisions for mid-market customers by creating innovative solutions and being the global leader in corporate performance management through a culture of creativity and problem-solving. To empower a global community of customers and partners around business decisions through Solver's innovative solutions. Happy Team, Happy Customer – start with a positive attitude. Ask Me Anything – relentlessly seek and share knowledge. Be Resourceful and Curious – find new solutions through innovation. Do the Right Thing – be honest at all times. Never compromise your or Solver’s integrity. Walk the Talk – my actions support Solver’s values and mission. Starts with Me – clear expectations, commitment, and personal responsibility. 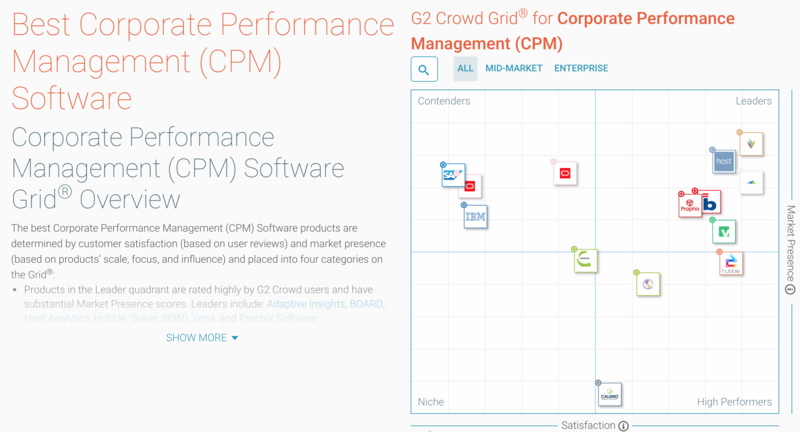 We're excited to be a part of the G2 Crowd Grid for Corporate Performance Management.